"Today, we're going to write an autobiography in class. Okay, I want you to take ten minutes and brainstorm as much as you can about your life then write a one page paper. You will start with an introduction, and the body of your paper will be in chronological order, beginning with your earlier childhood and evolving into who you are, and who you want to become. You must have a catchy ending as well. Got it? Good! You may begin." Hmm... What did I do wrong? What I said made COMPLETE sense to me! Let's take a step back and evaluate my approach. 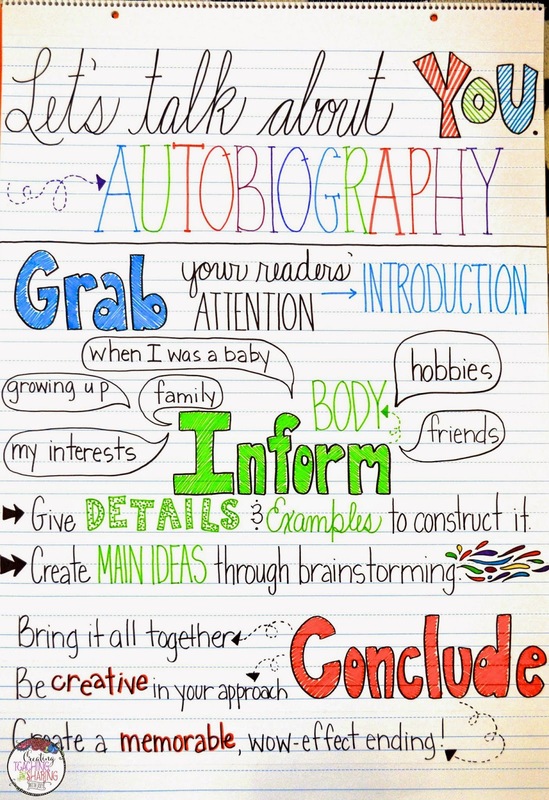 Do you think that this approach will produce amazing autobiographies? Or will it be a jumbled mess? I'm opting for the second. Why? BECAUSE I saw it happen! I have been teaching since 2007...not including my subbing time, and time spent in college. I have come to find, like many of us do, that the success in a lesson can single-handedly depend upon our approach and introduction to a topic. 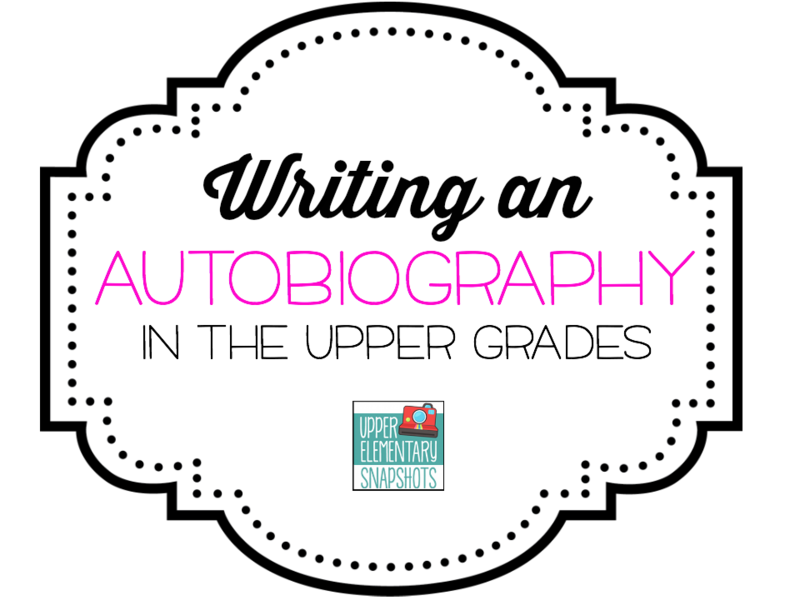 No, I didn't start my lesson on writing autobiographies like this. :) I may have done these things in bits and pieces, but they were spread out and with explanations and examples. I start with reading an autobiography. We started with our basal reader, and the story of William Joyce Scrapbook. This story is all about this author/illustrator and how his life evolved into one that celebrates creativity, as well as how he gets inspired for new projects. To do something well, it helps for our students to SEE and/or LISTEN to a finished product. I always provide a visual aid and classroom discussion on how to approach the task. 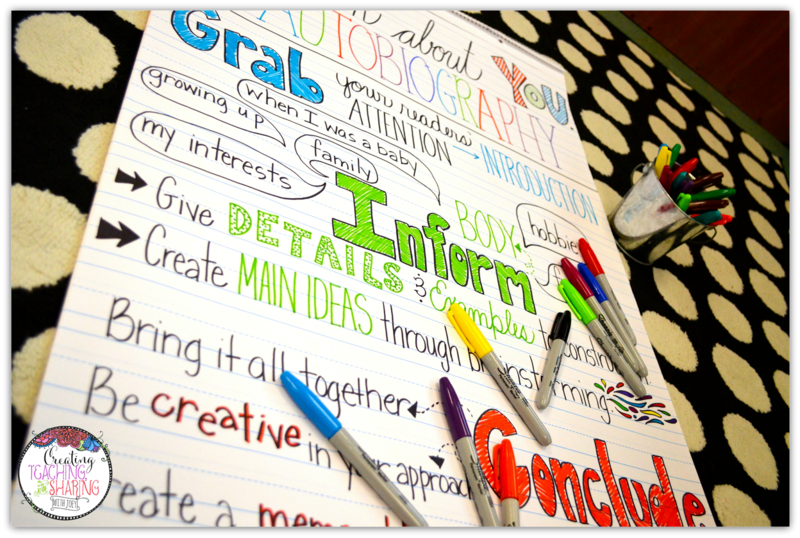 I love to make my anchor charts bright and fun to look at. 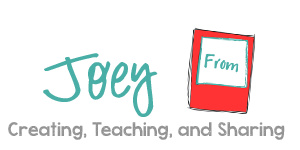 I believe that it engages my students, and almost lures them into reading them top to bottom. I also provide a structure. I like something tangible that they can write on. I gave my students this print out to engage their thoughts. The size of the blocks allowed them to focus on the most important details. 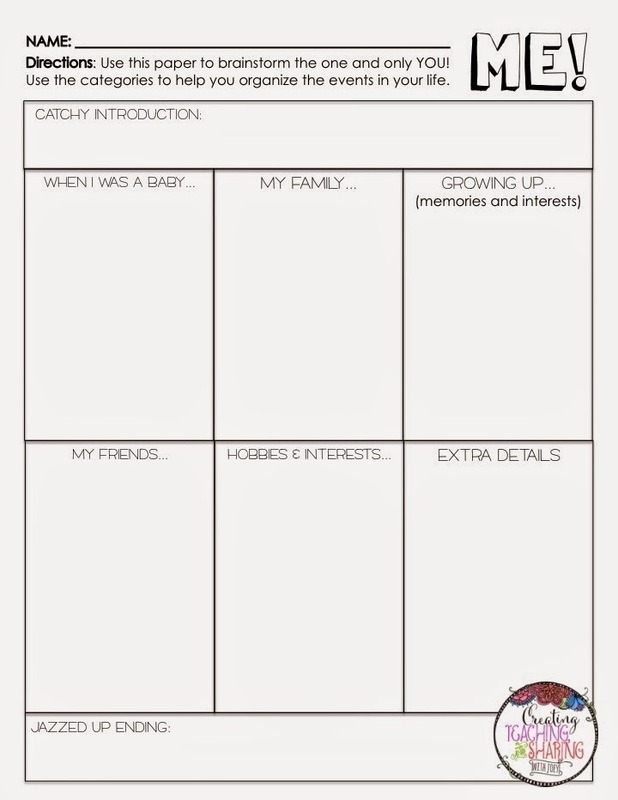 You can grab a copy of this worksheet HERE. Don't get me wrong, we love to do messy brainstorming sessions, where we spend a great deal of time making notes, organizing our thoughts, and creating webs that guide our work. They are a wonderfully messy, yet organized way of pulling details out of us. Oxymoron?...maybe...but that works, too! This works really well for introductions and conclusions. If your students are anything like mine, this is where they struggle. I get the same, "Hi! My name is John Doe. 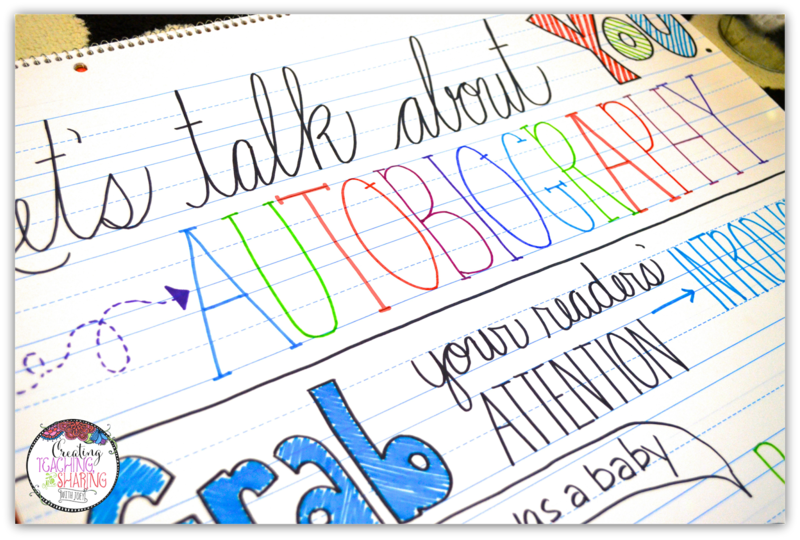 I am writing about myself, so sit back, relax, and learn all about me!" I put these babies to work! They really ARE great conversation starters. I think it's SO important to SHARE what we have created with one another. We provide constructive criticism on what we liked, or ways that we could improve something that we hear. It's a form of friendly competition in my classroom. Who can create the boldest beginning, or the most exciting ending? I'm also the type of teacher that says..."Eh...not exactly what I'm looking for here. Let's try this!" I tell my kiddos that it takes great practice and care in creating a perfect paper. The first copy, the second copy, and possibly even the third, fourth, and fifth copy may need to be tweaked a bit. I want to take a minute to talk about the actual assignment I gave to my students. I LOVE a good at-home project to get our parents to sit down with their kiddos to work on something together. This works for the most part. I know...I know...there are students who just don't have a great home life. I'm blessed with students this year, who even in a broken home, have someone that is willing to pitch in and make the most of what it is that they are to do. 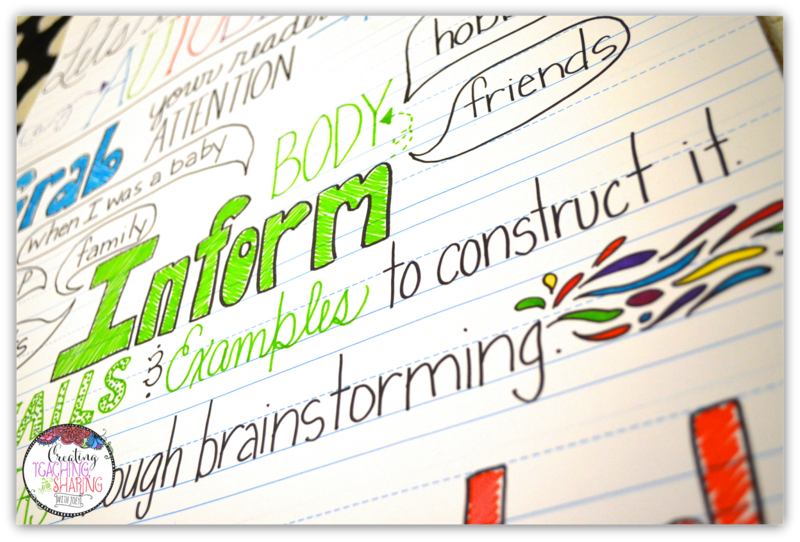 You use common sense and assign these assignments based on the needs of your students. 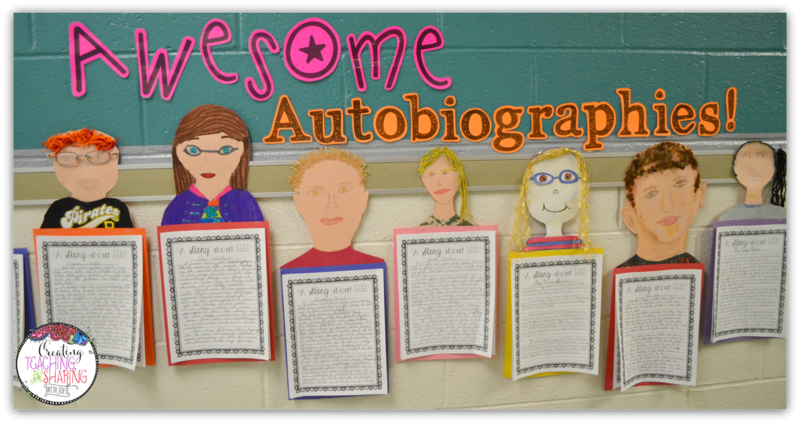 So, I started with a letter describing that we were reading an autobiography in class and that the students were working on writing their very own. 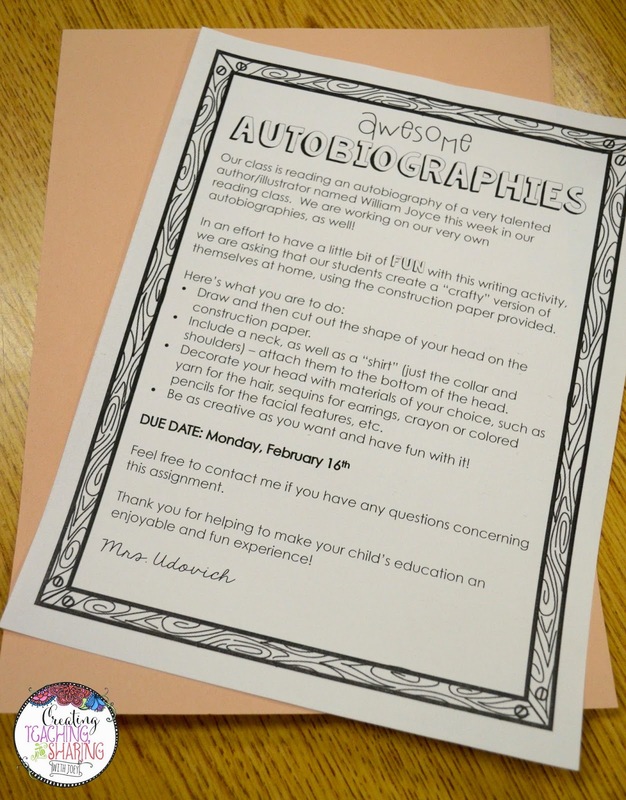 I sent that home, along with a skin-colored piece of construction paper and directions for making a crafty student model to accompany their writings. I'm never quite sure how these assignments will turn out, but I was pleasantly surprised with the results! 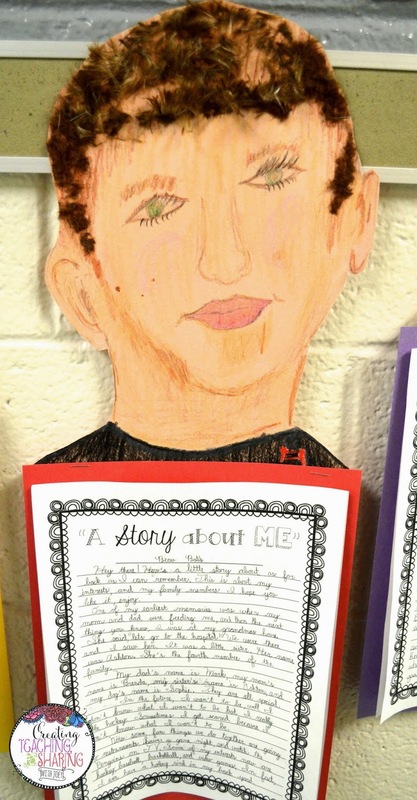 I loved seeing how students viewed themselves. Have a look! These are just a couple that came back. Overall, this lesson was a great success! I would be lying if I said that our grammar was 100% perfect, but that's certainly something that we're working on...and that's OKAY! The point is that we are writing. We are working through the writing process and becoming more alert of our mistakes, as well as recognizing when we should celebrate our creativity! 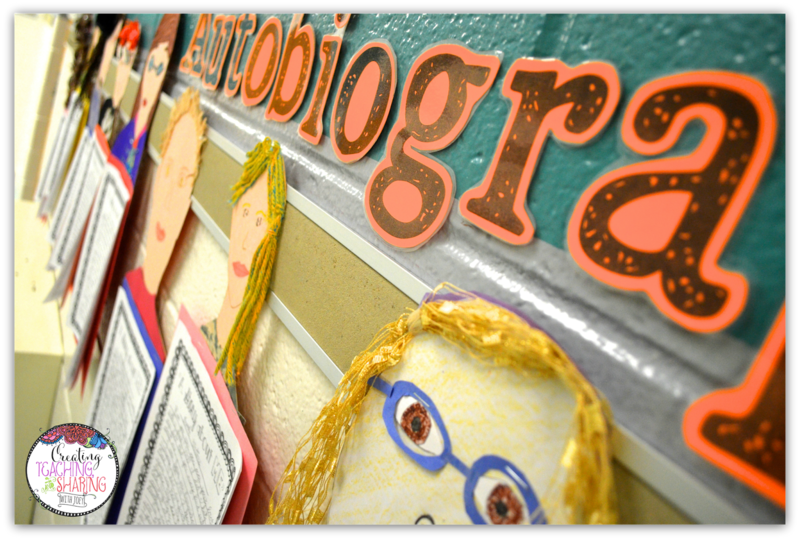 What have you done lately in your classroom to help promote the writing process? 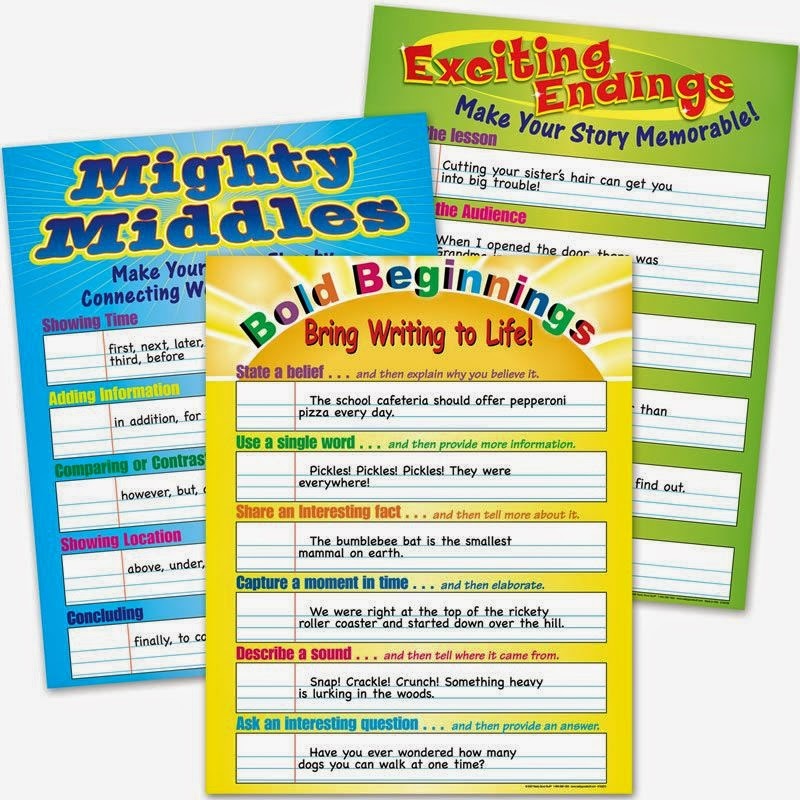 I'd love to hear how you make your students better writers! Let's talk in the comments below!